Ben vom Eschenbruch passed the Körung 'for life' with Körklasse 2A rating and his litter-brother, Banjo vom Eschenbruch, passed the Körung 'for life' with highest possible ratings for courage and working drives. 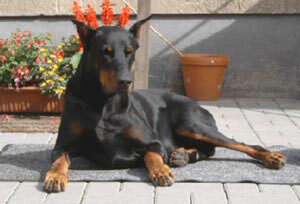 His sire, Cöbes von Warringhof, competed in the D.V. Meisterschaft and passed the Körung 'for life' with highest possible ratings for working drives plus was a winner of show titles. Ben's maternal grand-sire, Gero von der Mooreiche, was twice runner-up at the D.V. Meisterschaft and passed the Körung 'for life' with highest rating for hardness and working drives. Inou: ADPr and passed the ZTP with 1A rating for character and V for conformation. She is dam of the vom Eschenbruch “N, P” litters.